They looked as new as the day they rolled off the assembly line and, for a while, shared the spotlight with many of their newer brethren. 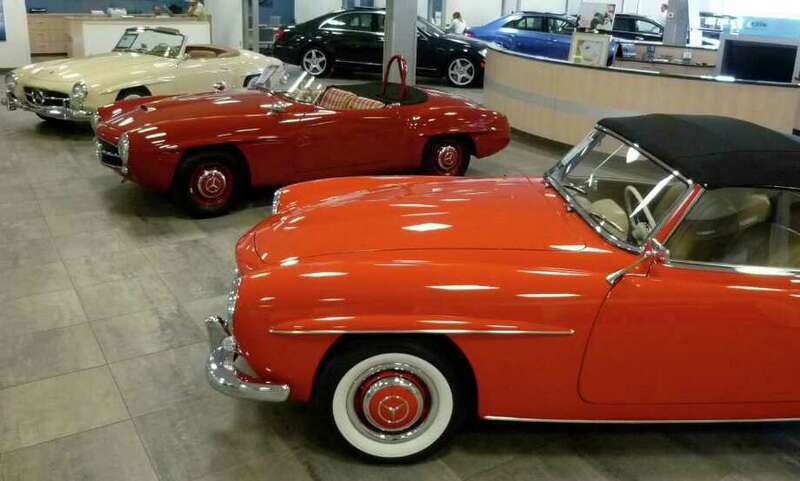 On Friday, Mercedes-Benz of Fairfield showcased a collection of vintage Mercedes-Benzes. The classic automobiles -- nine in all, dating from 1955 to 1983, part of a private collection owned by Margaret and Bruce Ianelli -- were displayed in the dealer's Commerce Drive showroom in celebration of the carmaker's 125th anniversary. A tenth classic car was contributed by a local customer. "The Best or Nothing" event, as it was titled, kicked off with a private reception for clients Thursday night. The cars were on view Friday and Saturday. "The Ianellis own an exotic, pre-owned car dealership in New Jersey and we have a collaborative business relationship with them," said Eric Ferits, the general manager of Mercedes-Benz of Fairfield. "They offered the cars to help mark the anniversary. Every single car is fully reconditioned and certified by MB Classic Center in California, which restores classic Benzes. The nine have all their original parts and mileage and a collective value of upwards of $3 million." In addition to showcasing the cars, the dealership was showing off its new space, after renovations last year and reopening in September as an "auto haus." Business development representative Terry Doll said, "The space allows us to entertain the local community with activities appropriate to all ages while highlighting exciting new cars like the 2012 CLS 63 AMG, which is scheduled to debut in the U.S. next month." One of the vintage cars on display was a 1956 Benz 300c Station Wagon, of which only one was produced. "It was ordered in 1956 by Mrs. Caroline Folke from NYC," said Ferits. "In order to accommodate her order, Benz had to outfit a regular C sedan. MB shipped the finished car from Stuttgart to the Benz Coachworks Co., one of the few remaining custom coach builders in Germany. Legend has it that Folke was so fond of the splendid vehicle that, whenever she traveled, she had it shipped by air to each of her homes in Paris, New York and Palm Beach." Another remarkable car was the 1971 280 SE 3.5 convertible. "It was presented at the Frankfurt Auto Show in 1969 as a luxury model and was originally purchased for $100,000," said Ferits. "It took two years to restore at a cost of $200,000." A red 1955 190 SLR Roadster was a standout. It debuted in 1954 at the New York International Motorsports Show. "This was a prototype race car that was not ultimately tested," said Ferits. "It has lightweight doors with no door handles and a small plexiglass windshield." A Fairfield customer who got wind of the show offered his own Benz classic, a 1956 300 SL Gullwing, for display. "It has been consistently serviced here by Paul Berg, our top master technician," said Ferits, proudly. Events like these, as well as its service and sales record may be the reason the dealership has been named by MB USA among the top 20 Mercedes-Benz dealers in the nation for five years, including the last two consecutive years under Ferit's oversight. Dealer events also seek to tie in other local luxury businesses, which enhances community relations. "Our partner for this event is Harry's Wine & Liquor Market," said Doll. "As part of their support, we had a brand new C-class parked at their store and allowed its clients to enter for a chance of usage over a weekend."